Notable Urdu poet, writer, journalist, broadcaster, translator, critic, researcher, linguist and lexicographer Shaan ul Haq Haqqi was born on 15th Dec 1917 in Delhi. He acquired his BA from A.M.U and Master in English literature from St. Stephen’s College, Delhi. 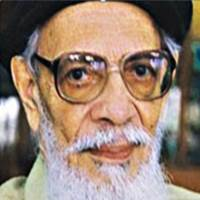 Haqqi published two anthologies of poems, Tar-i-Pairahan (1957) and Harf-i-Dilras (1979), a later collection of his selected ghazals was published under the title, Dil ki Zaban. His other publications include, Naqd-o-Nigarish (criticism), Maqalaat-e-Mumtaz, Shaakhsaanay (Short Stories), Maqam-e-Ghazal (edited work of Hafiz Hoshiarpuri), Nashid-i-Hurriyat, Nukta-e-Raz, Bhagvad Gita (Urdu translation) , Darpan Darpan (translation of poetry from various languages), Intikhab-e-Kalam-e-Zafar, Qitaat-e-Tareekh-e-Wafat-e-Ahle-Qalam-wa-Mutaliqeen-e-Ahle-Qalam, Lisani Masail-o-Lataif, Nazr-e-Khusro PaheliaN Keh MukarniyaN, Aaeena-e-Afkar-e-Ghalib, Nok Jhonk, Suhaanay Taraanay, and children’s literature with the title, Phool Khilay Hain Rung Birangay (Poems for children), Anjaan Rahi (translation of Jack Shaffer’s novel Shane), Teesri Duniya (translation of essays on politics and economy), Soor-e-Israfeel (translation of Bengali poet Qazi Nazrul Islam), Khayabaan-e- Pak (anthology of Pakistan’s folk poetry of about 40 poets). He also wrote his autobiography that was serialized in Urdu journal Afkaar.He also translated the Shakespeare’s Antony and Cleopatra, and Chanakya Kautilya’s Arthashastra. He tried his hand at other genres of poetry, such as Peheylian, Kehmukarnian, and Qitat-i-Tareekhi too. He was associated with the Urdu Dictionary Board for 17 years from 1958 to 1975, compiling a monumental 24-volume dictionary, which may be termed as his labour of love. Apart from Urdu Dictionary Board’s work, Haqqee Sahib compiled two dictionaries. The Oxford English-Urdu Dictionary and Farhang-e-Talaffuz is a pronunciation dictionary of Urdu. He died of lung cancer in Mississauga, Canada on October 11, 2005 at the age of 88 and was buried in Toronto, Canada.